All About the NLI - College Hockey, Inc. The early signing period for the National Letter of Intent (NLI) for hockey student-athletes entering college in 2018-19 begins November 8 and runs for one week (the regular period begins April 11). With that in mind, College Hockey Inc. wanted to share some basic information about the NLI and what signing one means. An NLI is essentially an athletic scholarship agreement between a school and a student-athlete. By signing an NLI, a prospective student-athlete agrees to attend the designated college or university for one academic year. Participating institutions agree to provide athletics financial aid to the student-athlete, provided he is admitted to the institution and is eligible for financial aid under NCAA rules. An important provision of the NLI program is a recruiting prohibition applied after a prospective student-athlete signs. This prohibition requires other institutions to cease recruitment of a prospective student-athlete once an NLI is signed. Once an NLI is signed, prospective student-athletes are no longer subject to further recruiting contacts and calls. Schools are assured that the student-athlete cannot decide to attend another institution without seeking a release from their NLI. Not all future college hockey players will sign an NLI. 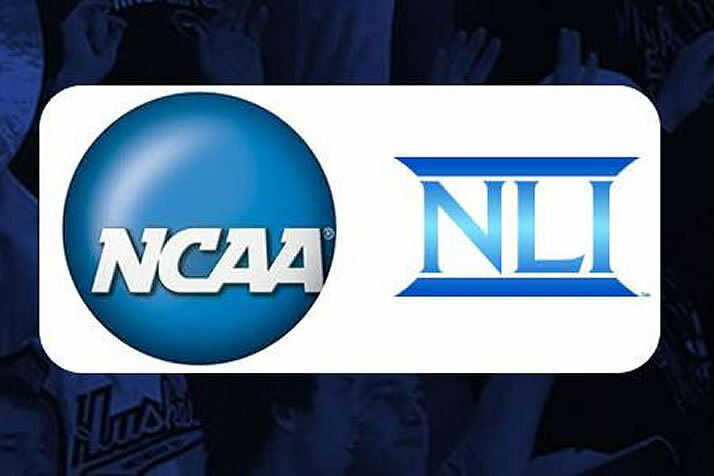 Schools that do not offer athletic scholarships do not participate in the NLI program – financial aid agreements at those schools are handled by the institution’s financial aid office. Some players may attend schools that offer athletic scholarships but will not receive a scholarship themselves; they also wouldn’t sign an NLI. Q: Am I required to sign an NLI? A: No. You are not required to sign an NLI but many prospective student-athletes sign because they want to create certainty in the recruiting process. Specifically, by signing an NLI, you agree to attend the institution for one year in exchange for the institution’s promise, in writing, to provide you athletics financial aid for the entire academic year, provided that you are admitted to the institution and are eligible for athletics aid under NCAA rules. Furthermore, but signing an NLI you effectively end the recruiting process – no other school may recruit you. Q: How do I get the NLI? A: The institution recruiting you will send you the NLI. It can be sent to you by express mail, courier service, regular mail, email or fax. The materials you receive must include an offer of athletics financial aid for the entire academic year. Q: Is an NLI only for one year? A: Schools may offer athletic financial aid for up to five years. The NLI, however, only obligates the student-athlete to attend the institution for one year. It should be noted that virtually all athletic scholarships are renewed for all of your college eligibility, provided that you remain in good academic and legal standing. They may not be decreased or eliminated based upon athletic performance. Q: I am verbally committed to a school; why haven’t I received an NLI? A: There are a number of potential reasons – that school may not offer athletic scholarships, or you may be committed for a future season (beyond 2018-19). If you still aren’t sure, check with the coach who recruited you. Q: If I plan to defer my enrollment beyond 2018, should I sign an NLI? A: No. If signing an NLI, it is intended that you will be attending the signing institution for the upcoming academic year. Q: What happens if I sign an NLI and later decide to delay enrollment to play junior hockey? A: If delayed enrollment was initiated by the signing institution’s coach or admissions office, the NLU must be declared null and void by the institution. If the delayed enrollment was initiated by you, the NLI remains binding. Q: How do I submit the signed NLI? A: You may send the signed NLI to the institution by fax or e-mail. You should also return the hard copy of the NLI, while keeping a copy of the NLI and financial aid agreement for your records. Q: When can I sign an NLI? A: You may only sign an NLI during a designated signing period. For hockey players entering school in the fall of 2018, the signing periods are Nov. 8-15, 2017, and April 11-August 1, 2018. Q: Is it necessary for a parent or legal guardian to sign the NLI? What if my parents aren’t available? A: If you are under the age of 21, regardless of marital status, your parent or legal guardian must sign the NLI in order for it to be considered valid. If your parent or legal guardian is not available (e.g., incarcerated, death), it is permissible for another, pre-approved individual to sign the NLI with you. Check the NLI web site for more details. Q: May I sign an NLI before I am certified as eligible by the NCAA Eligibility Center? A: Yes. You may sign an NLI before you receive your final certification determination from the NCAA Eligibility Center. When you sign an NLI, you agree to submit the necessary information and documents to the Eligibility Center. Later, if you are determined by the Eligibility Center to be a nonqualifier per NCAA Bylaw 14.3, your NLI will be rendered null and void. Q: What if I decide after signing the NLI that I want to attend a different institution, for example if the coach leaves? A: An NLI agreement is between a student-athlete and the institution, not the coach. That said, you may apply to the school for a release from your signed NLI. If the institution does not grant a complete release from the NLI, you may appeal for a release to the NLI Committee, which may grant a level of relief if extenuating circumstances warrant.